Jesse Dan Parker passed away on July 21, 2017 after a long battle with cancer. He was born July 29th, 1939 to Sam and Bert Parker in Idabel, OK. Jess was the eldest of six boys. He graduated from Idabel Gray High School in 1957 and attended East Central State University (ECU) in Ada, OK where he lettered in football. It was at ECU that he met and married his wife Latsy. Upon graduating from ECU in 1963 the family moved to Amarillo, Texas where he taught social studies and coached 7th grade football and basketball. It was there he won his first city championships in football and basketball. Two years later he became an assistant football coach and social studies teacher at Caprock High School in Amarillo. In 1967 Jess received a scholarship to the University of Kansas. After graduating with honors with a Masters Degree in American History the family moved to Arizona. In the fall of 1968 Jess taught in the social studies department at Phoenix Union High School and was an assistant football coach. 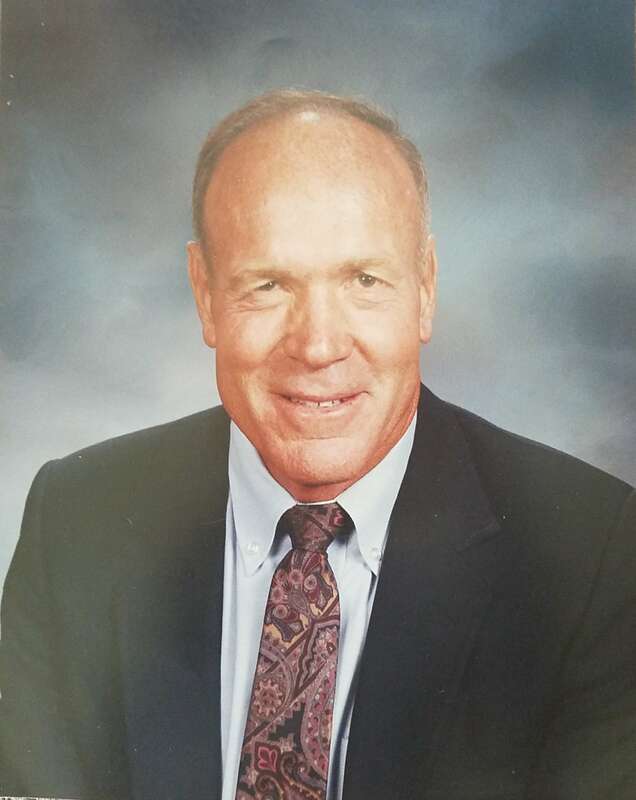 The following year at the age of twenty-eight he was hired as the head football coach at Camelback High School where he taught history and english. In 1973 his team was runner up in the state championship game then came back in 1974 to win the state championship. In 1976 Jess was hired as head football coach for the newly constructed Mtn. View High School located in east Mesa. In a few short years he became Chairman of the Social Studies Department and taught the first AP history class in the Phoenix metro area. During those years Jess’s teams won four state championships and three runner-ups . From 1995-98 Jess coached football at Texas High in Texarkana, Texas. In the three years there he turned the program around and they won their 1st playoff game in fifteen years. Jess returned to Arizona in 1999 and coached at Gilbert High School. During his ten years at Gilbert High his teams were in the playoffs eight times. Gilbert High appeared in the semifinals twice and quarter finals once. In 2008 Jess won his 309th game making him at that time, the winningest high school football coach in Arizona history. During his career he was a two-time finalist for the National Coach of the Year and in 2008 he was inducted into the National High School Coaching Hall of Fame. Other awards he received were the BYU Award of Teaching Excellence, two time Arizona Coaches Association Coach of the Year, Arizona Republic Coach of the Year, Phoenix Press Box Coach of the Year and was inducted into Mesa Sports Hall of Fame. In 2016 Mtn. View High School renamed their football field Jesse Parker Field. Jess was preceded in death by his parents Bert and Sam Parker and brothers James and Johnny Parker. He is survived by his beloved wife of 55 years Latsy, daughter Kathy Parker, sons Robert Parker (Terri) and Jonathan Parker and six grandchildren. Also, three brothers Steve (Shirley) Parker, Larry (Helen) Parker and Dennis (Merry) Parker. A Memorial Service will be held on August 19th at 5pm in the Mt. View High School auditorium. In lieu of flowers the family has requested that you consider a donation to either the Coach Jesse Parker Legacy Foundation or their place of worship Trinity Church. Coach Jesse Parker Legacy Foundation accepts donations via their secured website at https://coachjesseparker.org or you can mail contributions to 1347 N. Greenfield Rd. Ste #103 Mesa, AZ 85025. Their phone number is 480-924-6499. Trinity Church accepts donations by sending those to 2130 E University Drive, Mesa, AZ 85213. Their phone number is 480-834-9120. Coach Jesse Parker will always be remembered, loved and respected by all who played for him. He taught us hard work, dedication, and commitment towards greatness. Our thoughts and prayers go out to Latsy, and all his family at this time. We will miss you Coach! Saddened to learn of Jesse’s passing. Good coaching memories and the inspiration he gave to his athletes will stay with me. My condolences to his lovely wife and family. I am saddened to hear of one of my Hero’s passing .my thoughts and prayers go out to Mrs Parker ,Kathy and the rest of the family. Coach Jessie Parker will forever by an icon for the Mountain View Toros. He touched the lives of so many on and off the football field with real life values and respect. Our condolences are with his family. Love and prayers for comfort to Mrs Parker and all of Coach Parker’s family. I thank God for the extraordinary blessing of knowing, and being taught and influenced by this great man. Scene 1978, every time I smell freshly cut grass I am transported back to the field I stood on with the man who changed my stars. I did not know at the time how much Coach Parker would impact me every day for the rest of my life. I am so blessed to have been allowed to stand on the same filed as this hero. All of my love goes out to him and his wonderfull family now and forever. Tell we meet again Coach Parker, from a boy, you molded into a man. Jesse Parker was a man in search of perfection both on and off the field. Those who had him in the classroom know that his tests were tough, his passion was boundless, and you learned. It was the same on the field. You grew a backbone. There was no such word as fail, no backing down, and losing was hell on earth. I carry that with me today. Thanks Coach. So many memories of coaching against Jess over the years with my time at Maryvale. It is amazing in the coaching profession, how the competition creates such a mutual respect that draws us close together as friends. I cherished the times I came back to AZ from SD and meet with Jess over breakfast or lunch as we alternated paying the bill and reliving some of those special memories in coaching HS in AZ. I was planning to see Jess in August when I was coming to AZ to visit family but was so saddened to hear about his death prior to my visit. Latsy, you were such an inspiration to him and he loved you dearly as he did with all your children and grand- children. I hope it works for me to attend the memorial service on August 19 at Mtn. View HS during my visit to Phoenix. Thank you Coach for your dedication to growing kids into men. Your example of toughness, dedication, and strength will always guide me in my life’s adventures. Life is a leaf of paper white, where each one of us will write, a word or two and then comes night, greatly begin though thou have time, but for a line be that sublime, not failure but low aim is a crime. Thanks for the legacy Coach! Latsy we are so sorry for your loss. May God comfort you and your family as you mourn Jesse’s passing. Coach Parker knew I struggled in a class, he gave me extra credit to do. He believed in me and so many others. I have so much respect for him, yes he was a teddy bear as you got to know him. He was so nice to introduce the whole football team. I wanted to die and thank him the same time. Thank you for your example of believing in everyone. I will always remember you and miss him. I sure appreciate all of the great life lessons that I learned learned from Coach Parker. He taught me about mental toughness and how to be my best. Thank you! I never played on your football team, but was in your economics class inspite of my prayers I wouldn’t be. You made us work just as hard in the classroom and earn every grade we got. For this I thank you. It made me the teacher, father and husband I am today. I lovingly love my daughter and kids I teach making them take responsibility for their education and choices. May you rest in peace knowing you made Champions not only on the field, but in the classroom and in society as a whole. After graduating Mountain View High School years ago, I am set to begin a new math position this year at Gilbert. May I be half the leader you were at both schools. God bless you, Coach. On, Toro, On! We love this great family and are grateful for the many hours and time both in and off the field that Coach spent with our boys. Truly a great man that helped mold many young men and women in his career. Our condolences to Latsy and all of the Parker family. My prayers and thoughts for the family of this wonderful man. Had him for history at Mtn View and grateful to have had the experience of him in my life. The breadth of your influence is incalculable. My friends from service in the military, professional life, church, neighbors and friends from far and wide know about you and what you did for my formation in life and I have no doubt that all the other young men that played for you did the same. After my father’s influence on Andy and I, mom never missed an opportunity to invoke your name when it came to discipline, hard work and the pursuit of excellence. The entire Kunasek family holds your name out as what it means to be a true man….a gentleman – smart, intellectual, tough and compassionate. I count myself as one of the few blessed men who have walked this earth that have learned at your feet. God speed and God bless. Knowing and playing for Coach Parker was one of the greatest privileges in my life. I left McClintock High School to play for Mountain View High School my senior year. Coach Parker convinced me me that I would never regret this move and he was right. The people I met and the friendships that were developed still exist today. On many occasions I have had the opportunity to sit down and talk with Coach Parker years later. Not only did he never forget my name and who I was he had the unique ability to make you feel that you were his favorite player, even though I knew he felt the same about all his players and former players. Coach Parker had such an impact on my life that I named one of my sons after him, as I am sure many players did. That’s the kind of man he was. I will forever be grateful for what he has taught me. I love you Coach. Latsy, our prayers are with you. You had one awesome husband. What accomplishments he made. I know you are proud and your kids too. We’ll be thinking of you. Cecil (1959) and Carolyn (1960) McAlester Bufflaos. Latsy, so very sorry to hear of the passing of your husband. He sounds like a very accomplished man. May prayers are with you and your family at this time. Dear Latsy, you and the family have my utmost condolences. Just read the obit and all the comments. How wonderful that theses players and students felt do strongly about him. We knew that from all the public accolades but to read individual comments is so very touching. I know everyone in your family must feel so grateful that these people hAve taken the time to make the effort to write about their feelings about him. Know you must be getting so much love and hugs from family and friends. Wish I could give you a hug. Latsy, our hearts go out to you and your family. We’ve lost a great friend, but fortunately we are left with many great memories. Hats off to an icon in Arizona football and education. Jess Parker was a wonderful influence on my sons who were coached by him in the 80’s, during his time at Mountain View. They learned the meaning of commitment, hard work and how to become a successful person. The important values he taught have stayed with them for all these years and they are passing them on to their sons. Jess and Latsy are considered friends and we will always have a special place in our memories for them. We will miss Coach Parker, there are not many like him today. May God Bless their family and sustain they during this time of sorrow and grief. My sincere condolences for your loss. I really admired Coach Parker. He was a GREAT Guy ! My thoughts and prayers go out to you, Latsy , and family. Jesse touched the lives of so many people, not only in his coaching but as a teacher. I remember Jim saying ” Jesse had two different personality, one on the football field and one as an excellent caring, calm teacher. It was so great that Jesse was able to be when the football stadium was named in his honor. Jim enjoyed the visit of Jesse and Brad – recalling so many memories that they shared. It was kind of them to make the trip to our home in Goodyear. I can imagine them both in Heaven with Jesse on the football field in his favorite shirt, and Jim pacing on the sidelines. Two great people that helped make Mountain View an outstanding school and gave positive values to many students. Jesse will always be with you with your memories. Again my sincere condolences. One of the best memories of my time at Camelback was running on to the field at ASU to celebrate, after Coach Parker had taken the team to the ’74 state championship game & won! It’s something you remember your entire life. I was sorry to hear that such a good person isn’t with us any more, we so need great, honorable people, like Coach Parker. Thanks to the Parker family, for sharing your husband, your dad, your grandfather, season after season, with generations of Arizona/Texas fans. God bless you in Heaven Coach! Dear Latsy, Kathy, and the Parker Family; There are few people that influence a person’s life as much as Coach Parker did to me, and the many he touched in school and his life. I was blessed to have him as a teacher, as a mentor, and as a friend. I will continue to pass along the many recollections of his teaching methods to my peers, the boys I teach at scouts, and my friends as there were so many times he encouraged with knowledge, patience, support… and a bit of fear… that I would not finish without getting it right. Know that I’m also equally blessed for getting to know and work with both of you, Latsy and Kathy, as you both helped mold me as my life developed through subtle encouragements and support. The Parker Family is a blessing to us all, and it wont end with the passing of Jess’s life here on earth, although he will be missed in countless ways. From the entire Wilbrink family, we offer our love, hugs, and prayers to a family that has blessed us in countless ways. Growing up in McAlester and you being in the same class as my sister (1960), you were and are such a role model for me. When I moved to Tempe (1987) and began coaching on Karl Kiefer’s staff, Mt. View was playing in the state championship game and we saw each other at the ASU stadium. I often had a chance to visit with Jess and remind him that a lot of my classmates at Oklahoma Military Academy were from Idabel/Broken Bow. Latsy, you have always recognized me and been so kind to me especially at the fifty year reunion of the McAlester Class of 1960. Our plane flight back to the Valley was the fastest two hours ever with you filling me in on your classmates that I didn’t get to see. My special prayers for you and your family today are for grace, favor and strength. Please email me when you can and Julie and I would love to see you. Jess and you get the prize for the best couple ever.